The last Auckland Transport board meeting of the year is today. It also happens to be outgoing CEO David Warburton’s last one too with his replacement, Shane Ellison, starting on Monday next week. Here’s what I found interesting in the papers. There are quite a few interesting items on the agenda. These are all listed under Items for Approval/Decision. Wayfarer Pod Evaluation – I have no idea what it is but Wayfarer is a brand of bus ticketing console, I wonder if it relates to that? Hammerhead Land Purchase – This is land next to the Gulf Harbour ferry terminal. Smarter Transport Pricing Project Phase 1 – This is the road pricing study that came out of the ATAP process. National Ticketing Update – Some of the the system behind HOP was always intended to be rolled out nationally, there have been discussions of other regions combining to implement a system. There’s a bumper crop of interesting updates in the business report this month. They’re generally listed below in the order they appeared in the report. Warburton’s farewell – The report starts with some farewell comments by Warburton. New AT office – As part of a note about the move to ATs new office on Fanshawe St they note that workplace efficiencies have already been noticed. This is something I’ve heard from some staff too. Perhaps a good case study for the benefits of agglomeration. Diversity and Inclusion – They say they now have vision, communications plans and policy about this. This is great to see. Funding Approvals – As one of the approved funding approvals, it’s noted that $9.8 million has been approved for System Enhancements – AT HOP Capacity (Construction). I wonder if that’s just to cope with the growth of PT or will include other enhancements too. Airport MAAS (Mobility as a Service) – The NZTA are going to launch an app on Friday that is meant to be about helping people get to and from the airport called RideMate. This appears to be the same thing they launched in Queenstown some months ago called Choice. Hobson/Nelson Street Upgrade – ATs engineers and planners tend to have an unhealthy (for the city) reliance on traffic modelling to make decisions and that already appears to be on show with this project. The initial traffic modelling results show that the current cycleway upgrade on Nelson Street restricts the potential to further reduce the number of traffic lanes and traffic capacity along the corridor. Traffic modelling on Hobson Street shows that queuing would increase due to the proposed lane reduction outside the NZ International Convention Centre block. The project team is working to review and refine the model, and to consider mitigation options. Given ATs often cagey nature about what they’re up to, it also seems odd that this was included in the report given they say they’ve only just awarded a pre-concept study. Staff trying to frame the narrative to the board? Ferry Futures Strategy – AT say they’re coming up with 30-year strategy for ferries to “explore a new vision for ferries and to make more use of the harbour“. Maybe I’m wrong but I thought this was done just a few years ago. Rail pedestrian crossings – AT suddenly seem quite keen on improving safety at pedestrian level crossings on the rail network. The first two to be upgraded are Metcalfe Rd and Glenview Rd which will happen over the Christmas rail shutdown. They say five more will be upgraded between February and June next year and another four later next year as part of the Avondale to New Lynn cycleway project. New Network – As part of the roll out of the new network on the isthmus, AT is introducing a new Link branded bus that will run along Tamaki Dr (and then to Glen Innes). The report says that this service will be blue and called TāmakiLink. On Sunday the new network in East Auckland rolls out. The report lays out results for South and West Auckland with both showing good growth in usage. Bus Fleet Stats – As part of the new network we’ve seen a lot of new buses hitting the streets. 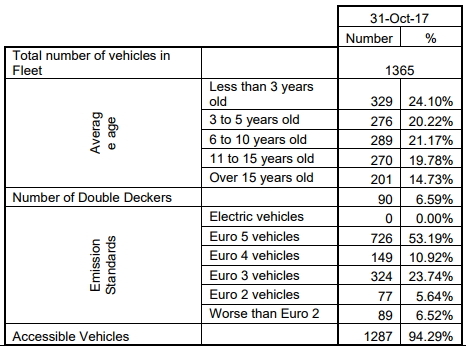 The table below breaks down the fleet by age and emissions standards. Devonport Shuttle – AT are going to trial a door-to-door service in Devonport connected to the ferry. I plan to write more about this but overall I’m not sure this is a great idea or use of ratepayer money. My guess is that if anything, it will only serve to change how existing ferry users access the station, not do anything to actually drive greater ridership. Hobson blocks up all the time in the PM peak anyway, taking another lane out will just push cars onto other lanes and force drivers to change their driving patterns, but that doesnt matter as long as they don’t block bus lanes. Nelson St unfortunately doesn’t cope well in the AM peak. The queue on Nelson queues back onto both motorways which probably annoys NZTA. Waterview hasn’t helped. Not sure you can take another lane out of Nelson unless you do something drastic to stop people driving in, or get NZTA to be ok with the motorway being blocked up with offramp traffic. Something drastic like taking away a lane traffic? Well, the problem is that it affects the motorway network and NZTA probably gets pissed off and it won’t change the number of cars that want to get to the city, it just changes their travel pattern. I’m thinking more like reducing the number of carparks available in the city. Yeah it will. If you took the lane out tomorrow, six months from now you’d be down net traffic equal to one lane of Hobson St. We’ve seen this with the removal of lane capacity for the City Rail Link works. All the prognostications were exactly as yours: won’t change the number of cars that want to get to the city so they’ll just change travel patterns and overcrowd all the parallel routes (by the way, cars don’t want anything, people want things…). But in reality the traffic has literally just gone away and the remaining routes are no busier than they were before, which actually means a net reduction in traffic overall once you account for the removed lanes. So sure, it is a case of changed travel patterns, but changed in terms of time and mode, not changed in terms of driving one block over. Yes, and this reduction in traffic due to road capacity reduction is well researched. Nick, while I absolutely agree with your proposition that congestion will cause car drivers to switch to other modes of transport, and I have read this is what Brisbane is doing (and there is no evidence that AT are) I don’t accept that volume of cars to the city has decreased post the CRL work. I have read that traffic flow to the city has not decreased in 10 years. I would be delighted to see figures that show otherwise. Euro 3 was superseded as a standard in 2005. Given the double deckers are all reasonably new it’s disappointing that so much of the fleet is so polluting. I don’t think it’ll be the Double Deckers in the Euro 3. I think the emissions standards figures are for all buses, the table just makes it confusing by randomly having the total DDs offset immediately above it. That makes much more sense when you look at it like that! Am I reading this right, money is being sought for a third main line from Westfield to quay park? No, it means the junctions at Westfield and Quay Park in addition to the third main between Wiri and Westfield. The Westfield Junction work is kind of connected to third main function. Quay Park stuff is still pretty undercover. Not sure whether that relates to the double slip points leading into Britomart, Port acces, Strand Depot or something else. WTF to the Devonport ride share thing. There are many options for getting to the ferry from around Devonport – frequent bus services, walking or cycling. The ferry already has heavy usage. What is the point of this? Surely AT should be encouraging the use of PT or active modes, not providing a separate car service to undermine them. I agree Nick – but the buses are not frequent and believe it or not we still don’t have integrated fares. It needs fixing from AT, but we seem to have a board (and councillors) who are asleep at the wheel and either can’t or won’t provide direction. Especially 2-3 passengers per vehicle… that’s crazy. They’d be better off with 12+ seats, trying to attract those who are more than a walk away from the existing connecting bus. If people want this service, it could be funded by a $1 /day charge on the ferry park n’ ride (which should happen anyway). The new network does not improve the frequency – it remains every 30 mins off peak. Until Lake Rd gets bus lanes the reliability of the buses will remain awful – they can be 10 minutes early or 20 minutes late. Plus they are slow – 45 mins for the 6km from Devonport to Takapuna. A lot of the carparking at the wharf is locals who could use PT but don’t – an old NSCC survey showed that 82 cars parked all day near the ferry wharf were registered to addresses less than 1km away and 253 within 400m of a bus stop for ferry feeder bus http://www.scoop.co.nz/stories/AK0610/S00049.htm There’s also a lot of kiss and ride. I suspect this initiative is to help deal with the bus issue until Lake Rd is fixed and attempt to reduce the traffic in the village which is a danger to school children and discourages cycling and walking. Take out literally all the parking and put in a massive drop off concourse. Just push anything parked into the sea. I can tell you from personal experience that there are a thousand reasons a bus runs late but only one reason it runs early: driver incompetence/couldn’t care less. For the Devonport ferry rideshare, they should just get uber to turn on their rideshare feature in Auckland. Wouldn’t cost ratepayers a cent. They could also encourage the supershuttle people to offer the service as its basically the same model as the airport shuttle. KK anyone else like Wtf devonport? why’s it get a door to door program? low density NIMBY suburb gains high density program? Devonport is not low density but it’s not high density either. It’s about the same as Mt Eden and Mt Albert. They just need frequent buses and integrated fares, the same as those other two areas get. Safe bike lanes too. Can anyone tell me where I can find proposals for the Hobson St/Nelson St improvements? Those are my streets, and I’d like to know more. 73. Discussions are still in progress between Auckland Council and the New Zealand International Convention Centre in relation to the Hobson Street streetscape and the Convention Centre’s frontage. 74. Pre-feasibility investigations are in progress and are anticipated to be completed by the end of 2017. If I had to guess, I’d say they want nice footpaths and calm traffic all around the convention centre. The opposite of how it’s designed now. re “System Enhancements – AT HOP Capacity (Construction).” – Interesting that the emails I get for auto topup been setup etc seem to be coming later and later in the day, they used to be in the early morning AM time frame. Wonder if this is related to the system overloaded with the current numbers (IIRC the daily transactions are over the designed limit). Good to see some work actually getting done on ped level crossings, also Papatoetoe one about to close. I personally think Devonport Shuttle is a good idea. The private operators are considering too high risk to try. So council should proof it first. Once it is successful, the operations should be transferred to private operators. So they can run it without significant public money. The only issue I can think of is the breakeven point. To yield reasonable breakeven to offset driver cost, a high utilisation is required. The best way to make it economically successful, is to use driverless autonomous vehicles. However I think it will be years away until technology become mature. Looking at the prices that they are charging, this will never be commercially viable. $3 per person per trip. Say 3 people per trip , you might get one outward trip and one inward for each sailing. Do the maths, that won’t make money even with 100% utilization. I agree, but also wonder if it’s a loss leader. If it is, I’d love to know how much of an increase in patronage is required to consider the project a success. It will never work unless it costs people the same to park at the wharf or along King Edward Parade as it does to take the shuttle. Once again AT have gone for half arsed measures that will only lend weight to “people just want to drive their cars”. If AT put its big girl pants on and faced up to reality, it would be charging for park n ride and working hard to put in cycle infrastructure. Instead they come up with excuses and cave every time a local cries about it. The conversation in the area is dominated by Boomers who of course think the area is perfect and any change is a negative. The fact we also have the most useless local board in the city doesn’t help. The most useful thing most of the board members could do is act as a traffic calming speed bump on Victoria Road. The most useful thing most of the board members could do is act as a traffic calming speed bump on Victoria Road. That’s not quite fair. They think the area would be perfect if we just four laned Lake Road. Well it is four laned. Just two of the lanes are too narrow for cars. Here’s something that didn’t make the report but was released today. It seems AT has an obsession to provide either free or cheap parking. And of course this comes at a cost as is revealed in the press release -the money has to come from somewhere. It also diminishes the prospect of feeder buses being deemed successful -why take the feeder when you can park for free? Its just unbelievable. So much evidence from overseas that free park n ride only cannabilises PT and cycling. But AT just blithely carry on spending public money on providing free space to store private property. Let’s just pray this new CEO has some clues because anything achieved while Warburton was there was despite of him not because of him. No need for mirrors, I don’t think it’s an organisation that does self reflection.